BEIJING, Feb. 22 -- Chinese go chess player Chang Hao beat South Korean 9-dan Park Yeong-hun on Thursday at the ninth Nong Shim Cup in Shanghai to claim the first trophy for China in the competition's 16 years history. 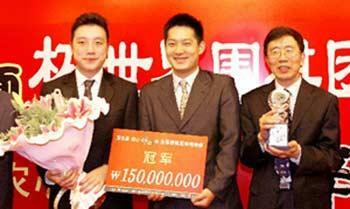 Chang Hao's victory at the 13th round also won him 20 million South Korean won prize money. Chang overcame Takao Shinji 9-dan at the 11th game on Tuesday to knock the Japanese team out of the cup match. He then narrowly defeated the formidable Lee Changho of the South Korean side the next day to cement three consecutive wins. Chang Hao won the 11th Samsung Cup champion by defeating Lee Changho 2:0 in the final in 2007. In 2006, he ended the 1st Kangwon-Land Cup ring contest between China and Korea with four straight wins. The Nong Shim Cup is a gathering of the best go players from South Korea, Japan, and China. The Nong Shim Cup is sponsored by Nong Shim Food Company of South Korea.